What is a Folding Bike? Folding bikes are a great way of incorporating cycling into your daily life. They are particularly popular for people who live in urban areas and those who might not have the storage space for a normal bike at home because of their compact size and versatility. Public transport and commuting are where folding bikes come into their element. Your daily commute to the office may be too far to cycle and traffic ridden by car, but the trip to and from the nearest bus stop or train station is often much more manageable. Folding bikes are ideal for this type of commute and is a far quicker and much more environmentally friendly form of transport. Are there different types of Folding Bike? Generally speaking, most folding bikes are very similar to one another. Most will have 16 to 20-inch wheels and disassemble into a small package when folded (with varying degrees of ease and size). What makes folding bikes so unique are the variety of hinges and quick release mechanisms on the frame, which allow the bike to be folded in different directions. There are some manufacturers that design folders with larger wheels, which comes in handy if you need to cover greater distances or carry more speed. These bikes will look like a normal bicycle when assembled, but will be more difficult to store when folded due to the larger wheel diameter. Unlike other categories of bicycle, the essentials of a folding bike are the same. What makes them different to each other is how people customize them for their needs, such as variances in luggage options or colour schemes. What type of Folding Bike should I buy? The perfect folding bike for you will depend on a number of factors, such as how often you need to use your folding bike, how much space you have at home and how far you want to ride it. 16 to 20-inch wheel folding bikes are very competent machines and will be ideal for most urban commuters, or those looking to enjoy short trips at a reasonable pace. So if you intend on using a folding bike every day, the ease of assembly and low weight nature of these type of folding bikes make them the ideal choice for the daily trip to the office. Riders who want to venture a bit further afield may want to consider folding bikes with more traditional wheel sizes. These will carry more speed on the road and allow for greater distances to be covered, but may be a bit more difficult to carry and store once folded. Whatever the case, it’s useful to know that Brompton offer an incredible variety of customization options for their range of folding bikes. So even if you can’t find the right folding bike for your needs off the shelf, you can probably design it for yourself with their online bike builder – you can build your Brompton to your specifications and get it delivered to your nearest Rutland Cycling store. What should I look for when buying a Folding Bike? When looking for a folding bike, the frame is the most important element in terms of compact disassembly. Brompton have become the icon of this category due to the way in which their bikes are designed to fold up, using a hinge in the middle of the frame. It is also worth considering what the frame is made from, as heavier materials will make assembly and portability that little bit more difficult. Folding bikes are often designed with single-speed or hub-geared drivetrains, a lot like standard urban bicycles. 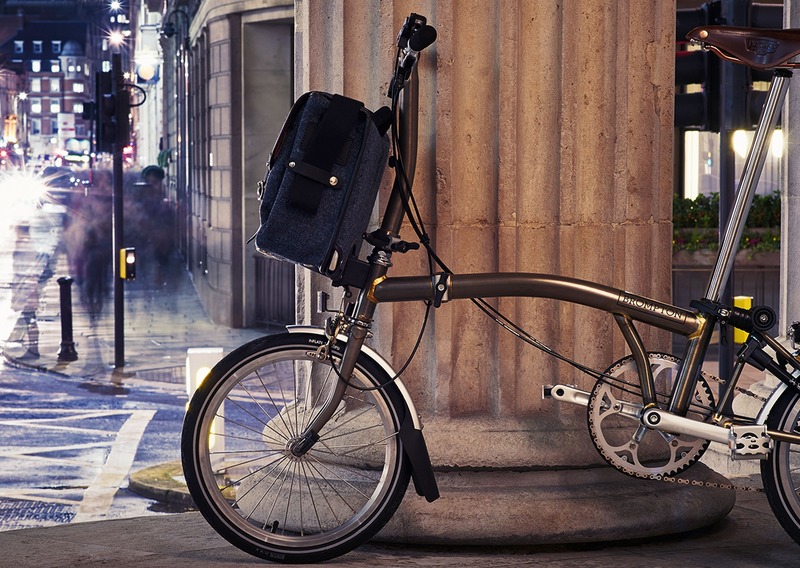 Some will come with a wide range of ratios to allow for flexibility in riding, such as Brompton’s touring folder. Wheel size is another important thing to consider, as it will be the defining feature of how your folding bike rides. Larger diameter wheels will roll over and have less trouble tackling potholes or rough roads, but will limit how small the bike can be folded up. Smaller wheel diameters are surprisingly quick and allow for much easier storage and portability.